Footage captured from a bird’s-eye view of a Chernobyl-era nuclear power plant in Crimea shows its heart – the reactor. The unfinished plant has been standing abandoned for almost three decades. 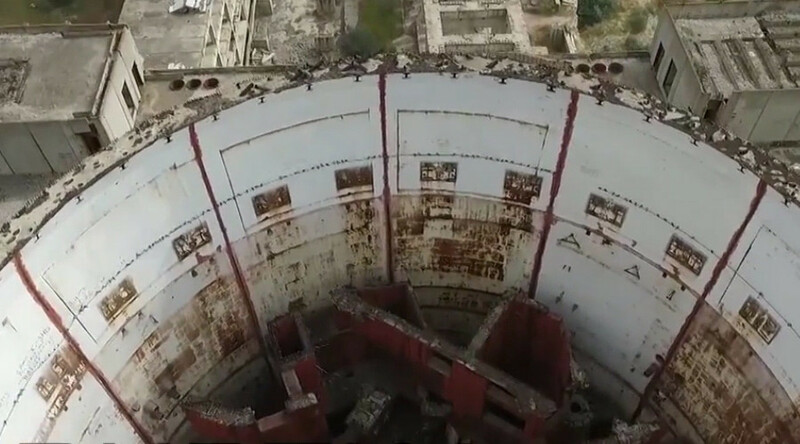 Rare drone footage shows the decaying infrastructure of the Crimean Atomic Energy Station on the banks of Aqtas Lake in the eastern part of the peninsula, the construction of which was started in 1975. The video shows the whole territory of the crumbling nuclear plant including the building for the main energy block and cooling system from up above. The project of the plant, which was supposed to supply the whole peninsula with energy, was abandoned in 1989, three years after the Chernobyl nuclear power plant catastrophe. One of the alleged reasons for aborting construction was the location of the Crimean plant on a geologically volatile site. However, some blame the project’s closure on lack of funds due to the economic problems in the Soviet Union. At the time when the construction was abandoned, the first nuclear unit was 80 percent finished and the second was 18 percent finished. However, no nuclear fuel had been stored at the facility. The Crimean power plant was reportedly one of the most expensive nuclear power plant projects to ever be abandoned before being finished.